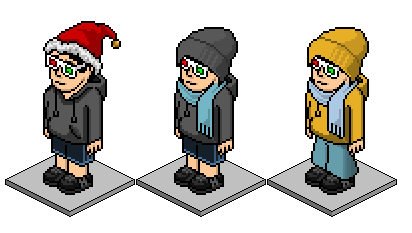 Look These are some things I wear on Habbo. Not always these but you can just click people Im Kyledavis1! Do you want to know how to join? Well Ill be making a Tutorial Soon on Habbo Questions! Go to http://www.habbo.co.uk/ Then join. I think you have to be 13 or Somethin. Oh Kane only just told me about it! Subject: Re: My Habbo Styles!